Last night I dreamt of snakes. I am not particularly afraid of snakes. Actually I am more phobic regarding spiders. Just about anything that has more than 4 legs and creeps and crawls around the floor, wall or drops from the ceiling or out of trees--totally freaks me out beyond belief. Yes, spider's petrify me. Hopefully one day I will overcome my fear of them. Come to think of it the other day as I waited for my youngest son to get out of school one or two spiders crawled up and around my leg and I did not panic. I simply brushed the first one away and then when another or the first one came back I brushed off the spider again and just go up and stood on the parking lot. I did not get the shivers, shakes or queasy stomach. What progress without even thinking of it. Yeah me! But, last night I dreamt of snakes, well actually it was morning when I had this dream. There were at least 8 to 10 snakes in the room in which I was standing. In the dream I did not have any fear or worry for the snakes being there, however, someone told me that one of the snakes was venomous. I began to worry about which one was venomous as I wanted to avoid getting bit. I was very calm as I began to leave the room in order to avoid that one snake. Even as I began to make my way out of the room I still did not have any deep seated fear. Strangely though the snakes began to follow me. It was like they really liked me and wanted to be around me. I tried to sneak out of the room and lots of little snakes followed me wanting to be near me. I began to walk down the hallway trying to leave the snakes and thats when I woke up. What strikes me about this dream was that I was in no way worried about the snakes...other than avoiding the venomous one. I was not fearful. Snakes represent death and rebirth... change. In many cultures snakes represent healing. Snakes are one of the five animals in Chinese philosophy. The Chinese power totem animals include Snake, Tigers, Dragons, Leopards and the Crane. I would guess that Snakes represent earth, Dragons represent fire, Cranes represent water.... But I could be wrong. I need to look this up. Coincidentally the image of the above snake looks like several of the snakes in my dream....the oranges were tiny and looked like corn snakes. 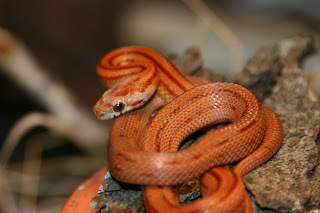 I have never heard of corn snakes until I saw this image. And one more note...the last three nights I have slept with five decent sized crystals right above my head....sort of like a crown. 3 very clear quartz crystals and 2 optical calcite crystals and I must say I have had some very clear and vivid dreams....thus the snake dream. Ewww. Spiders give me the creeps - I've always had issues with them. Snakes, no problem but spiders... uh, I hope I don't have dreams having read about them.